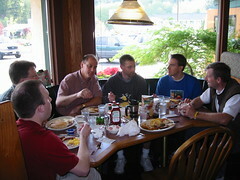 Every Friday morning, the men staff at Sidney Glen Elementary get together at Sharis. (hey, it's close to the school!) The waitress knows the routine. Wayne orders coffee only, Chad orders his 'mint tea', Don brings his own coffee, Scott brings his coupons and I have the Dutchman's special - 'morning favorite" (overeasy with sourdough) Here is where all the really good gossip of the school goes on. I think it's where all the important decisions are made too, but don't tell the thirty or so women that work at SG. Seriously, it's great to have a funloving bunch of guys to work with and share some comraderie. Tonight we went to a fundraiser for our church's mission trip to Haiti this summer-A great dinner with the South Kitsap HS jazz band providing the entertainment. The event raised about $6000 towards a motorcycle and refrigerator for the pastor of the church in Les Irois (our sister church in Haiti) It was especially meaningful to Bjorn and I as we were part of an earlier team to the chruch.